These printable Bible study notebook pages are a keepsake to record your daily Bible study notes. It includes a cover page with Proverbs 18:4, a thought-provoking page where you can write the date, the passage you read, thoughts about the passage, and what you’re grateful for. 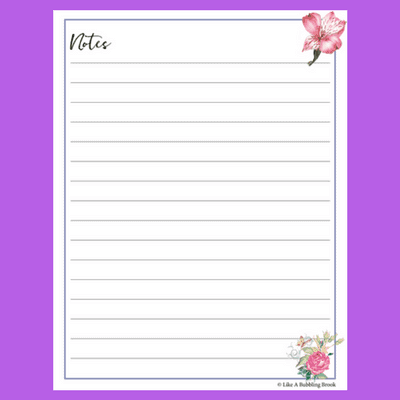 There is also an additional page for more notes or writing out Scripture. It’s perfect for growing strong in the Word! Please see full details in the description below. 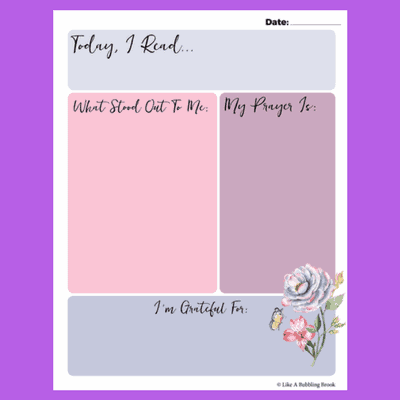 These printable Bible study notebook pages are a keepsake to record your daily Bible study notes. It includes a cover page with Proverbs 18:4, a thought-provoking page where you can write the date, the passage you read, thoughts about the passage, and what you’re grateful for. There is also an additional page for more notes or writing out Scripture. 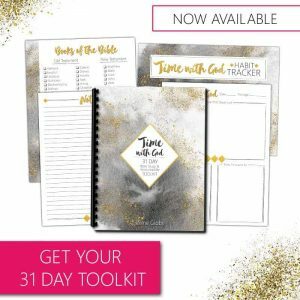 If you enjoy pretty printables and quiet time in the Word, then you’ll love these bible study notebook pages! It includes 3 printable PDF pages, perfect for putting in any 8.5X11 three-ring binder (not included). The link to download your pages will arrive in your email receipt from me (not your Paypal receipt), and you will also be taken to an order confirmation page with the download link after your purchase.